The U. S. Constitution begins with the soaring words We the People, but we, the people, have little to do with the document as most of us have come to know it. When most people think of the constitution they think of it as a legal instrument, the province of judges and lawyers, who alone possess the expertise and knowledge necessary to discern its elusive and complex meaning. This book outlines a very different view of the Constitution as a moral and philosophical statement about who we are as a nation. This Civic Constitution constitutes us as a civic body politic, transforming the people into a singular political entity. Juxtaposing this view with the legal model, the Juridic Constitution, John E. Finn offers a comprehensive account of the Civic Constitution as a public affirmation of the shared principles of national self-identity, and as a particular vision of political community in which we the people play a significant and ongoing role in achieving a constitutional way of life. The Civic Constitution is the constitution of dialogical engagement, of contested meanings, of political principles, of education, of conversation. Peopling the Constitution seeks nothing less than a new interpretation of the American constitutional project in an effort to revive a robust understanding of citizenship. It considers the entire constitutional project, from its founding and maintenance to its failure, with insights into topics ranging from the practice of deliberative democracy and the meaning of citizenship, to constitutional fidelity, civic virtue, the separation of powers, federalism, and constitutional interpretation. The Civic Constitution, in Finns telling, is primarily a political project requiring an active, engaged, and most importantly, constitutionally educated citizenry committed to the civic virtues of civility and tending. When we as citizens are unwilling or unable to tend to and sustain the Constitution, and when constitutional questions reduce to legal questions and obscure civic interests, constitutional rot results. And in post-9/11 America, Finn argues, constitutional rot has begun to set in. 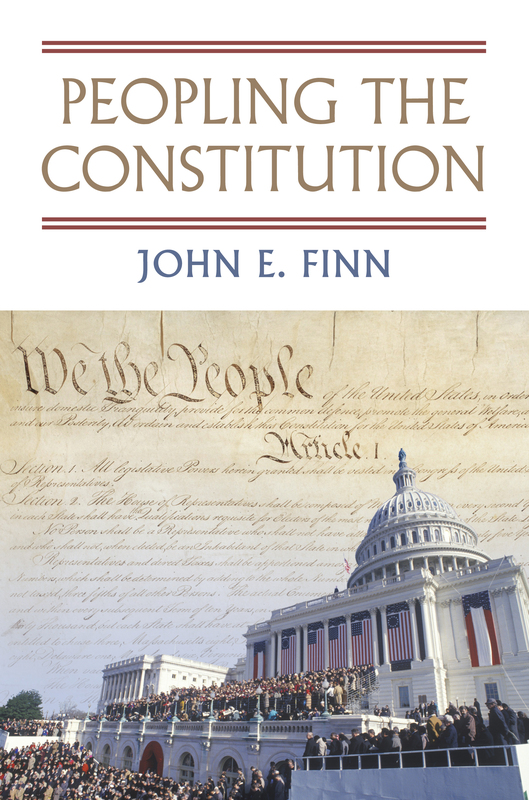 With its multi-dimensional vision of constitutional governance, Finn's book stands as a corrective to accounts that locate the Constitution in and conceive it essentially as a legal instrument, making a powerful and impassioned argument for restoring the people to their rightful place in the politics and practice of the Constitution. John E. Finn is professor of government at Wesleyan University. His publications include American Constitutional Law: Essays, Cases, and Comparative Notes, with Donald P. Kommers and Gary J. Jacobsohn, and the highly regarded Constitutions in Crisis: Political Violence and the Rule of Law.